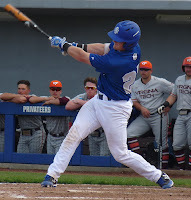 In game one of the Southland Conference baseball tournament in Sugar Land, Texas, the tournament's lowest seed, #8 New Orleans, sprung an upset on top-seeded Sam Houston in 10 innings, 4-3. Unable to start ace lefty Bryan Warzek, the Privateers faced even longer odds than one might see in an 8/1 game. Warzek, who did not throw until this past Saturday due to weather complications, was not fully rested by the start of the SLC Tournament. New Orleans had to rely on the volatile John Michael Stephens, who has been the team's most up-and-down performer. Fortunately, UNO got the good version tonight, and his seven strong innings against the formidable Bearkats put the Bucs in position to win. Still, New Orleans was down 3-1 in the eighth until Beau Bratton's two-run triple tied it up. The Privateers got it to extras, when they were able to scrape across one more run via Cody Ducote's sac fly. After some quality relief work from John Barr, Reeves Martin shut the door on SHSU in the 10th and the Privateers had the victory. New Orleans will play tomorrow night at 7:00ish against Houston Baptist, who defeated Central Arkansas 14-4.